The PC-9 is a development of the very successful PC-7 trainer. It features a more powerful Pratt & Whitney Canada PT-6 turboprop, and an advanced cockpit with a raised instructor's seat and flight instrumentation closely resembling front-line combat aircraft to ease the transition between training and operational aircraft. The rather flimsy top-opening box reveals two translucent white sprues containing the fuselage and wings, a more opaque white sprue with the propeller, a small zip-lock bag holding the resin cockpit parts, another bag with alternative vac or injected canopies and a large instruction leaflet. Nestled under the instructions is a separate bag holding the very complete decal sheet. The fuselage sprue was also in a zip-lock bag and it may have been that the wings were in there too, but since I'm not the first Aeroscale staff member to have looked into the box, I can't be certain they were. The plastic parts very definitely show their short-run heritage with a fair amount of ragged looking flash. Clean-up before assembly is not an option. The panel lines are very finely scribed and quite consistent over the entire surface of the model. I cut the fuselage halves from the sprue, which allowed me to confirm that the panel lines match up very well along the aircraft centreline. The fuselage is two halves from nose to tail. The cockpit is completely resin. The side consoles are nearly featureless but the instrument panels have some very nice detail which will benefit from careful painting. The nose wheel well is a resin part. The instruction sheet calls for 5 - 7 grams of nose weight to be installed above the nose gear well. There should be enough room in the nose for it. The Propeller is offered in optional positions. There is a full prop or separate blades. If the model is displayed on the ground the propeller blades should be installed in the fully feathered position since the PT-6 automatically goes into feather as it is being shut down. OzMods offers a choice of canopies; either a vac (with spare, just in case) or injected canopy to suit modellers of every preference. The injected canopy looks slightly cloudy, but it's very likely that a dip in Future will sort that out. There is a nice little section of the instructions dealing with Futuring canopies. Neither canopy captures the bubble cross section, but that's very common in this scale. The wings are in two pieces; one lower wing half from wingtip to wingtip with a one piece upper half onto which the completed fuselage sits. There is little detail inside the wheel wells, but only the strut doors are open when the gear is down, so there's not much opportunity to see inside. The tailplane is a one piece moulding that fitts onto the rear of the fuselage. Parked aircraft are often seen with the elevator in the nose-down position. It will have to be cut away and repositioned. It would have been nice to see a separate elevator. The separate fin and rudder fit onto the top of the tailplane piece. There may be filling needed so careful test-fitting is the order of the day here. The landing gear struts and wheels are fairly well detailed but will definitely benefit from careful cleaning up. The main struts look to be a bit thick which may be a limitation of the moulding process. The nose wheel is moulded with its strut, which will also need cleaning up and careful painting. The main wheels are in plastic, and will need to have their axle holes drilled out deeper. The gear doors have no detailing on their inside surfaces, but they're rather small. I don't compare models to drawings or published measurements. When assembled it will capture the distinctive look of the PC-9. The instruction sheet is printed in black and white on four pages. The assembly steps are supplemented by some nice hints, tips and web addresses for additional tutorials and modelling advice. Interestingly, the instructions do not show the wing being glued to the fuselage. A beginner may be a little confused, but really, it would be cruel to give this kit to a beginner anyway. Modellers experienced enough to tackle this kit won't bat an eyelash at the instructions. This kit offers a choice of the RAAF's Roulettes or Royal Thai Air Force display teams. Sufficient serial number decals are offered to allow you to build any aircraft in service with either team. The Roulettes scheme is overall red with white accent stripes on the fuselage and wings and a white and blue tail. The Thai aircraft is overall white with red and blue accent stripes. The blue stripes for both schemes are provided on the decal sheet but the white and red must be painted. The Roulettes scheme will be the trickier one to mask. Either one will be striking in your display cabinet. There is an addendum sheet with Pratt & Whitney logos for the Thai aircraft. The painting instructions are in full colour except that the blue accent stripes are printed in black. This is slightly confusing but easy enough to figure out. 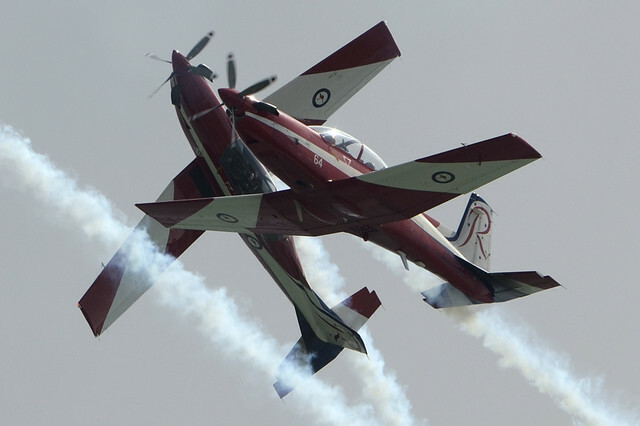 A pair of Roulettes aircraft doing their thing in the Australian skies. Then another view showing off the wing markings. Aircraft 13 of the Royal Thai team. Highs: A very nice little kit with attractive paint options. Lows: This is a limited run kit which may frustrate beginning modellers. The price is correspondingly high. Verdict: A worthy addition to your collection of 1/72 trainers.